Harold Nathan Braunhut was an American mail-order marketer and inventor, from 1926-2003. Braunhut used comic book advertisements to sell an assortment of quirky products, many of which became cultural icons including X-Ray Specs which claimed the wearer to see through clothing and flesh. The product has appealed to generations of curious pre-adolescents, Crazy Crabs which were simply hermit crabs, Amazing Hair-Raising Monsters, which was just a card with a printed monster that would grow "hair" (actually mineral crystals) when water was added. Invisible Goldfish, imaginary fish that were guaranteed to remain permanently invisible and, of course, the Amazing Sea-Monkeys, which were tiny brine shrimp eggs that "came to life" when water was added. 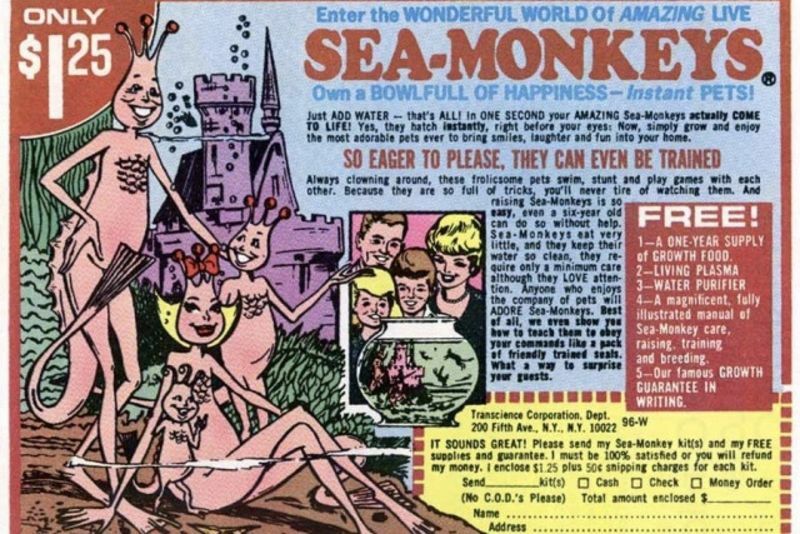 Sales took an upswing when comic book illustrator, Joe Orlando, drew comic book advertisements showing the humanised Sea-Monkeys enjoying life in their underwater fantasy world. Billions of the tiny creatures have been sold over the years and have generated fan websites, a television series, and a video game. Astronaut, John Glenn, took 400 million "Amazing Sea-Monkeys" into space with him in 1998. However, the Amazing Sea Monkeys inventor didn't always put a smile on people's faces, in 1968 Harold invented something called the kiyoga spring whip which was a defensive mechanism. The “spring whip defence mechanism” was brought to market as the 'Kiyoga Agent M5', a spring-loaded rigid whip that telescopes out of its handle with the press of a button. Overwhelming evidence of Harold shows that he was part of the KKK and a close friend of Harold quoted him as saying, "Hitler wasn't a bad guy, he just got bad press". How does a guy who invents all of these wonderful things also promote such horrible ideas? Well, he had more than one identity. The one, 'Harold Von Braunhut', was a born Jew who pledged large portions of his fortune to an anti-Semitic hate group, while the other, 'Harold Nathan Braunhut', is the one who we all identify as the Sea Monkey inventor.